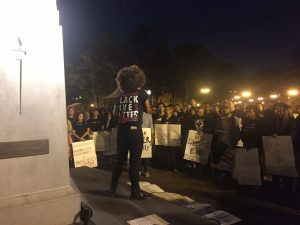 Claps, speeches and songs rang in front of the Tommy Trojan statue Thursday night as more than 100 students from both USC and UCLA, faculty and community members gathered to stand in opposition to a violent white nationalist rally that took place in Charlottesville, Va., and to stand in solidarity with those affected. “Ain’t no power like the power of the people, because the power of the people don’t stop,” they chanted. Many of those in attendance held signs and wore shirts with slogans opposing racism and in support of communities of color. Saphia Jackson, co-director of the USC Black Student Assembly, opened the rally encouraging students not to remain silent, and reminding those in attendance that white supremacy hits close to home, referring to the presence of Traveler, USC’s mascot, which bears a name similar to Robert E. Lee’s horse, and the attempted removal of a statue depicting him motivated much of the violence in Virginia. BSA co-Directors Saphia Jackson and Ariana Seymore declined to comment on if they would seek to remove Traveler’s statue from campus. 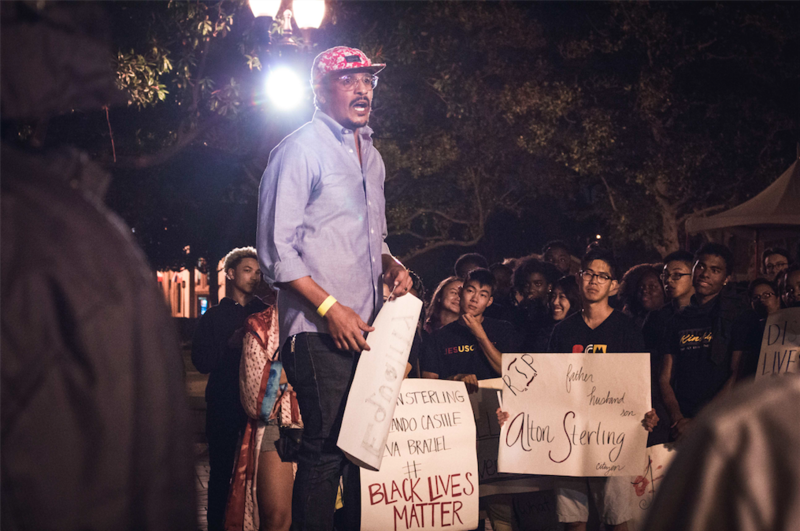 Jackson addressed the crowd assembled, urging students to embrace activism. Jacob Pettis, a freshman majoring in political science, shared that it was just his second day on campus, but that it was crucial for him to stand up to racism and bigotry. 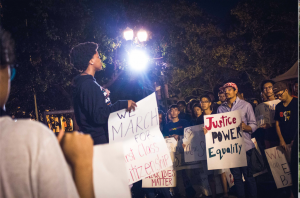 Along with those from USC, Kosi Ogbuli, the vice chair of UCLA’s African Student Union, and a dozen other students from UCLA visited campus to support USC BSA’s activism. Aaron Fluornoy, owner of Lil Bill’s Bike Shop, which operated as a bicycle repair shop near campus for nearly 25 years, encouraged students to resist the University’s hierarchy and said that he hoped to encourage students to acquire knowledge and lead change. BSA co-director Ariana Seymore said that she would like the University to provide forums for conversation with high-ranking faculty regarding the issues that face USC and the United States regarding prejudice and racism, providing more support for cultural centers and providing a social space for conversation within minority communities. CORRECTION: a previous version of this article stated that USC’s mascot, Traveler, was named after Robert E. Lee’s horse. It has been updated to reflect that the horse bears a name similar to Lee’s horse. 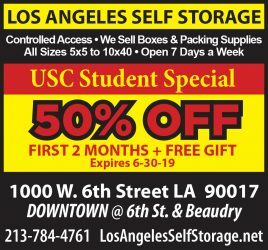 The Daily Trojan regrets this error. LMFAO! You 100 folks! HHAAAAAAAA! This is why folks dont take you seriously! PUPPETS!!! HAAAAA YOU PUPPETS ARE GETTING PLAYED!!! The whole country is laughing at you. this is just horseshit. Someone had to say it…fight on. Americans abhor white supremacy – even whites! Because there were some fringe nuts in Charlottesville doesn’t mean America needs “systemic change.” We are not a racist nation. We are to be judged by the content of our character, not by the color of our skin. (sound familiar?) E pluribus unum (out of many, one) is what makes us great. It’s sad that those ranting about the mascot’s name don’t realize how hysterical & ridiculous they look. Don’t be a pawn of those seeking to divide our nation. Please develop more critical thinking skills rather than victim mentality. You are a victim if you decide to invest yourself in that mindset. That would be such a wast of potential for you and our nation. The ONLY supremacy Traveler stands for is supremacy of Trojan football over all other opponents..that’s it. BSA – do not lose support from tried & true allies over the name of our mascot. No one in the Conquest Nation thinks of our Traveler as any sort of representation of that treasonous confederacy. Pat Saukko, widow of original rider Richard Saukko stated that when they bought the horse in 1958, he already had that name. This is just beyond. This has to be a joke. Maybe fake news? I know! It’s an article from the Onion. The horse is a racist? Now, who’s the horse’s “arse”? An absolutely ridiculous assertion about the horse being a racist symbol. If anything the entire Trojan name would be offensive as the Trojans, Greeks, Romans and pretty much every major society in history practices slavery. This has all gone way to far. They need to start requiring all incoming college students to pass a course in being an adult and accepting that the world is full of people who don’t agree with them. Every major society on every continent practiced slavery but many “studies” majors believe America invented slavery. And I agree with you about the adulthood class. It should replace the “cultural competency” programs that they force on students during orientation. We might want to enlighten them to the fact that there are more slaves in the world today then at any other time in the history of mankind. White Europeans and Americans are the least likely people to own slaves today. 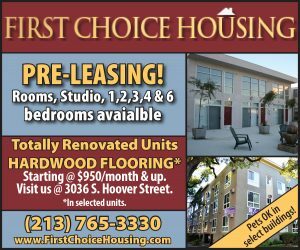 Guess what people are most likely to own slaves today? Good point- such as the children in the Republic of Congo that are put to mine for the cobalt used in today’s smartphones, cars and computers. 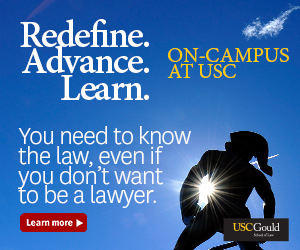 If you are lucky enough to attend USC, do not waste your time being political pawns to try to fit in. It takes a lot of energy just to make something of yourself, do not waste it on empty rhetoric. There was just 200 goofball racists in Virginia, it is not part of a growing national trend.